In November 2012, His Beatitude Archbishop Anastasios of Tirana, Durres and All Albania made a statement regarding public anti-church actions in Russia. In his letter of support to Patriarch Kirill, His Beatitude Archbishop Anastasios says that he has known His Holiness Patriarch Kirill for over forty-four years, since they both participated in the activities of the World Orthodox Organization SYNDESMOS. In the years that followed, future primates met on regular occasions and worked together in the Central Committee and Assemblies of the World Council of Churches, in the group of Religious Leaders of Europe, and participated in official meetings of the Orthodox Churches’ delegations. 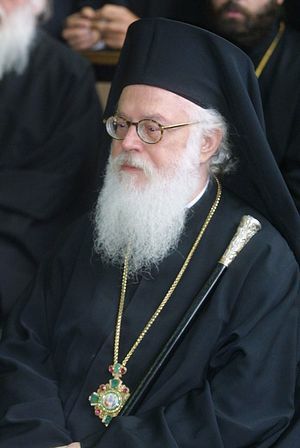 “I always remember his gentleness, vital contributions, clarity of thought, his kind way of sharing ideas; capable and flexible, with respect for the other in dialogue and even in conflict,” Archbishop Anastasios writes in his letter, “His election as Patriarch of Moscow and All Russia gave to many of us great expectations that through his solid character and charismata he could serve with wisdom the beloved Russian people leading them on the path to spiritual freedom, justice, and love, with creativity. It is really painful so many years after the end of the atheistic persecution to see again, in an Orthodox country, people who destroy sacred symbols, crosses and even proceed to provocative actions in order to ridicule the Orthodox Church and generally the Christian faith – such as in the Cathedral of Christ the Saviour in Moscow. These new attacks by militant secularists against the Church clearly do not contribute to the peaceful coexistence of religious and non-religious peoples, and do not offer a proper vision for modern society”.